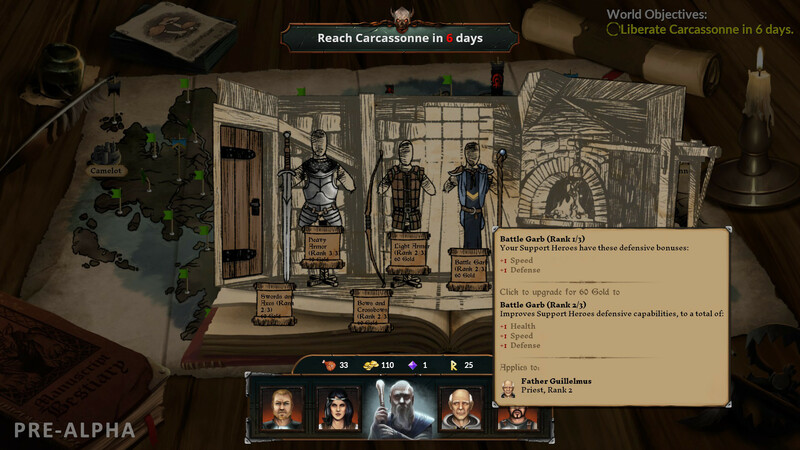 The Hand of Merlin is a turn-based rogue-lite RPG in which Arthurian legend clashes with sci-fi horror. 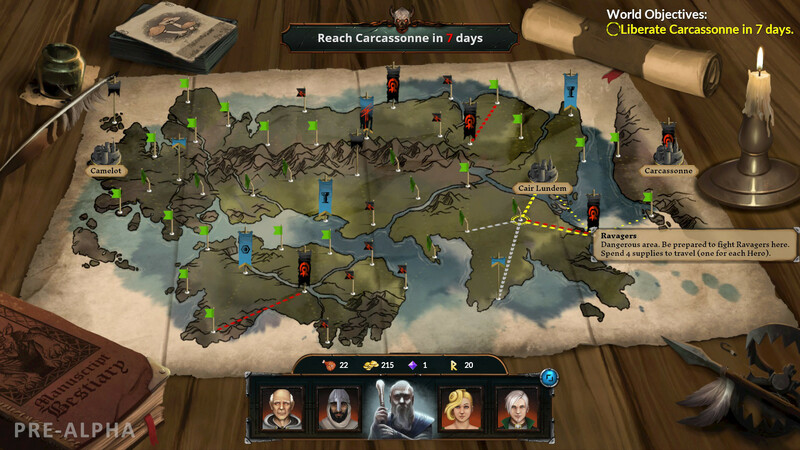 Recruit a company of up to four mortal heroes and guide them in spirit on a desperate journey from Albion to Jerusalem. Explore a richly-imagined medieval setting on the brink of apocalypse. 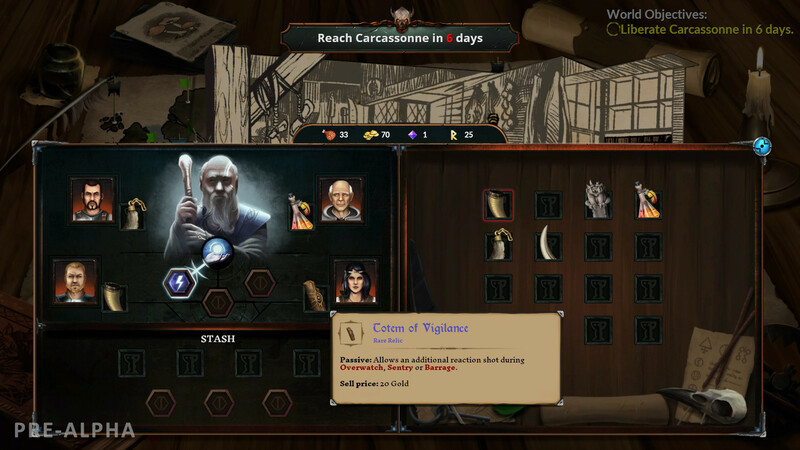 Trade with merchants, improve your heroes, and unearth ancient relics. Search for the lost fragments of your soul, scattered across the multiverse – and save as many worlds as you can. 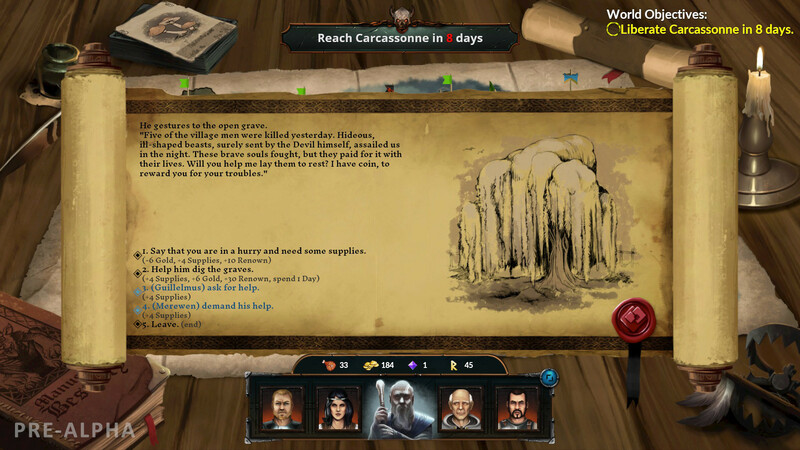 A Roguelike Experience – Carve a path across the lands of Albion, Marca Hispanica and Al-Andalus. Will you take a dangerous route, risking life and limb in pursuit of a legendary relic? Or will you choose a safer path? Plan and prepare. Negotiate, barter, fight. Tackle challenges. Suffer losses. Recruit new Heroes. Earn Gold, Supplies and Renown. Be careful: your choices are permanent, as is death. But don’t tarry – evil never rests. 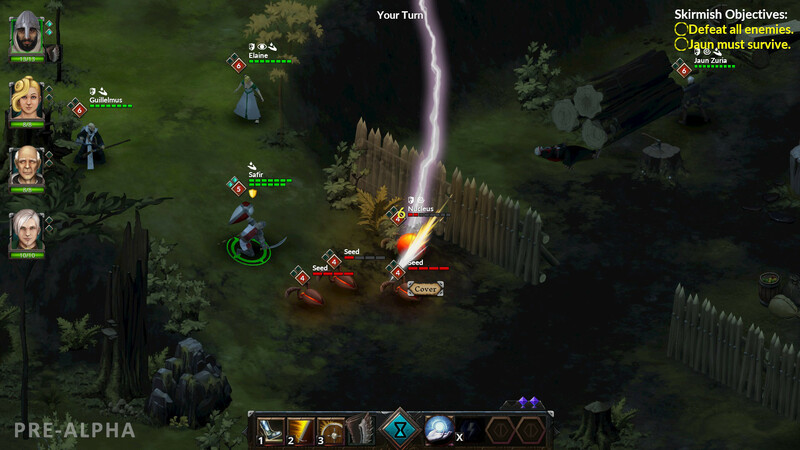 Tactical Turn-Based Combat – Master the tactics of squad-based and turn-based combat to conquer both human and demonic foes. Your enemies will be tough and ruthless; make use of high ground and cover, set up ambushes and coordinated attacks, harness synergies between different Hero classes and skills. Non-Linear Narrative – Enjoy a compelling story inspired by Arthurian legend, the Matter of France, and the history of Al-Andalus – with an unusual twist. Make choices in interactive encounters that change every time you play. Written by Jonas Kyratzes (The Talos Principle, Serious Sam 4) and Verena Kyratzes (The Lands of Dream, Serious Sam 4). 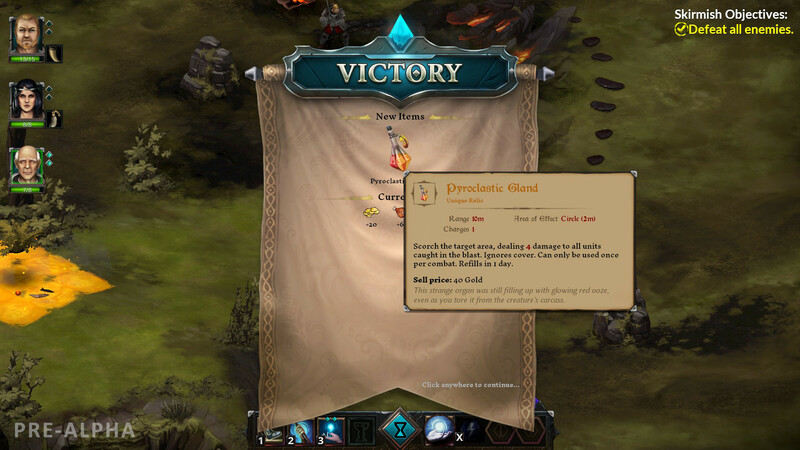 Dynamic Leveling – Use Renown to level up your Heroes, and choose between a randomized set of new skills or improved attributes. But choose wisely! Select skills with great synergy and balance your party for the road ahead. Equipment Upgrades – Seek out towns to improve your arms and armor, or stumble upon hermit artisans in the wild. With every day that passes, the world plunges deeper into darkness, and you will need all the equipment gold can buy. Relics – From a peasant’s humble luck charm to the legendary sword wielded by Arthur himself, items imbued with magical power are scattered about the world. Some you will be able to purchase from merchants and collectors, but others will have to be earned through acts of heroism – or displays of wit. Spells – Rain thunder and brimstone upon your foes! Seek out and gather Soulstones to restore your power and unlock new Spells. Even if defeated, your spirit will retain all of your collected arcane knowledge as you jump into the next dimension. Alternate Dimensions – As you jump from one parallel dimension to the next, history is reshaped. Different kings rule the land, changing the encounters, characters, and events. No two worlds are ever quite the same, and each journey will be unique. And should your heroes fall, remember: defeat is not the end, only a new beginning. The Hand of Merlin is a turn-based rogue-lite RPG in which Arthurian legend clashes with sci-fi horror. 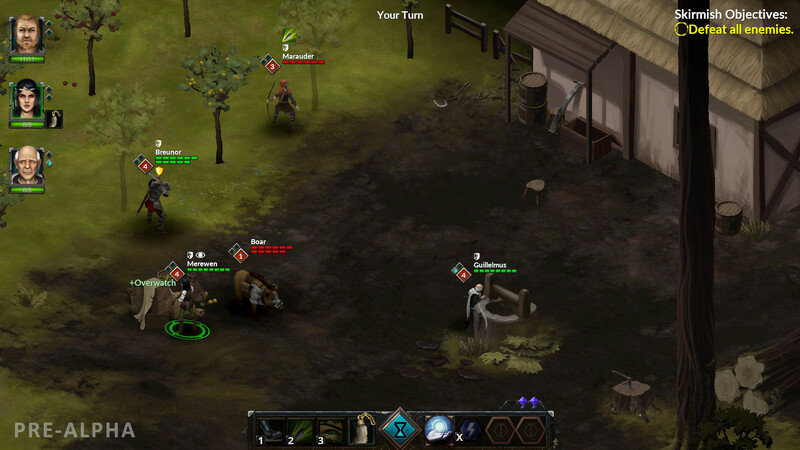 Recruit mortal heroes and explore medieval lands assaulted by an otherworldly evil. Search for the lost fragments of your soul, scattered across the multiverse – and save as many worlds as you can.